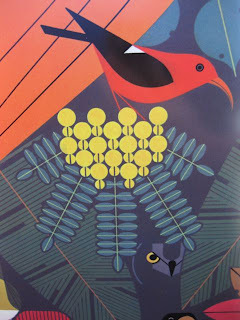 A few weeks ago, we dropped of our Hawaii Volcanoes National Park poster by artist Charley Harper to be framed and we finally picked it up yesterday. We were completely exhausted yesterday and barely had the energy to run into town, but when the lady behind the counter unwrapped it we both came back to life. 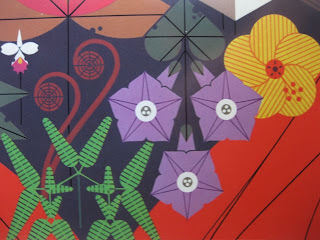 The poster measures 29" x 39" and was printed in 1986.We chose a simple 1 3/4" square black frame with non-glare glass. It set us back a bit more than we wanted, but to finally see it removed from the tube it lived in for the last 4 years was worth it. As usual, Charley managed to capture all the amazing beauty of Hawaii's native plants and animals as only Charley can with. First off, he placed them in the composition as they would be found at their proper elevation. Then he uses "minimal realism" as he calls it to capture the "details" with the fewest details possible. Lines, circles, triangles, squares etc. Charley often said he never counted the feathers , only the wings. 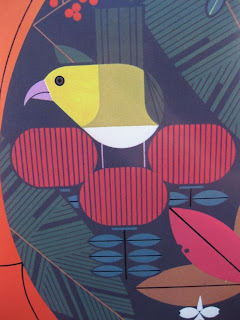 Below are some details of some of our favorite native species... although we have never seen an 'I'iwi, 'Akiapola'au and the Palilia. Still hoping to one of these days. Silversword plant and ʻAkiapōlāʻau bird. 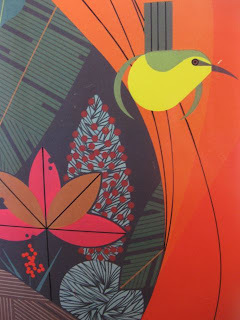 'Ohiʻa lehua flowers and Palila bird. Love it! That non glare glass is a killer to the wallet but makes such a viewing difference especially with flat surfaced, darkly hued works. No one draws birds like Harper-- i LOVE this! Gorgeous poster! Thanks for sharing. As a somewhat newbie to Hawai'i, it's been great fun to learn about all the native flora and fauna, and this poster shows it all off so wonderfully. WOWsah. the pueo! 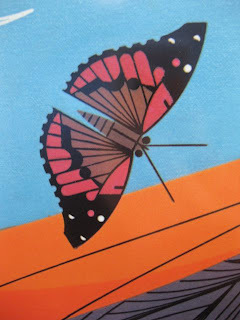 and i had no idea we had our own butterfly. the waves at he bottom are just so perfect. it is stunning. Aloha Kristin and Deb, Charley had a gift at getting it just right. Also, notice the layers of lava along the bottom. Water then the jagged lava that shatters when it hits the water and breaks off, then the smooth pahoehoe. Also what you don't see are the 3 colors of orange he used for the lava. He is Brilliant. 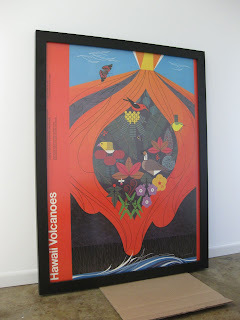 I had no idea Charlie did a Hawaii Volcanoes poster! Wow - okay, must start the hunt. Gorgeous. 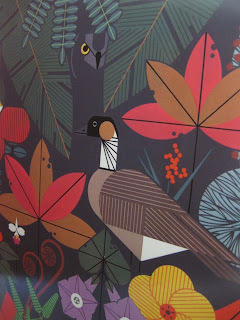 Aloha Amy, click the Charley Harper Link in the post.... it will take you to where they sell them.. and they have a smaller size as well. I would LOVE to have one of EVERY park.